The Haiti Earthquake: Was Pat Robertson Right? Like many of you, I'm praying for those affected by the earthquake in Haiti. Heartbreaking. It's been well publicized that Pat Robertson claimed the earthquake is God's judgment on Haiti for past sin, including making a pact with the devil. Yesterday I was on the radio talking about the subject of evil and suffering, and was asked about Robertson’s comments. If you wish, listen to the audio of the 10-minute exchange concerning this. Now there were some present at that time who told Jesus about the Galileans whose blood Pilate had mixed with their sacrifices. Jesus answered, "Do you think that these Galileans were worse sinners than all the other Galileans because they suffered this way? I tell you, no! But unless you repent, you too will all perish. Or those eighteen who died when the tower in Siloam fell on them — do you think they were more guilty than all the others living in Jerusalem? I tell you, no! But unless you repent, you too will all perish." This is no time to declare that Haiti as a nation is being judged. We don’t know that, because God has not revealed it, and it is just speculation. We do know that we ALL deserve God’s judgment, and we all live by his mercy. 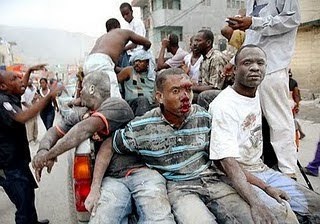 Does Haiti deserve worse judgment than America does for our slaughter of 50 million unborn children and our exportation of glorified sexual immorality to every corner of the world? If you're looking to give to help with this disaster, check out the front page of the Eternal Perspective Ministries website for links to a few of the many ministries who are actively responding to the crisis. (You can also send your contributions to EPM, and 100% of designated contributions will be passed on to worthy ministries working in Haiti.) You might also want to check out an article about natural disasters excerpted from my book If God Is Good.